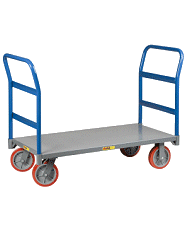 Easily lift and transport loads from delivery trucks to docks or use to inventory items on storage systems. Durable steel unit has a 500-lb. load capacity and rolls on 6in. x 2in. mold-on-rubber rear wheels with 2in. semi-steel front wheels. Two rollers on the handle ease loading into delivery trucks. Platform lifts approx. 1in. per winch rotation. Horizontal load center is 10in. Deck height is 1/4in. with 2in.H side lips. U.S.A.